Every summer, my husband and I love taking our kids somewhere new for vacation. We believe that habitually going the same places every year gets boring and when it comes to vacation we want to be anything but routine. This year we chose Tennessee as our destination for “new” fun. It is remote, far away from where we live, and has all the components for the great time we were looking for. Wanting to add a little spontaneity to our trip we didn’t book a hotel or anything in advance. We packed our bags, hooked up the GPS, loaded up the van and took off for our Tennessee adventure! Arriving in Tennessee my family and I expected to see a lot of hills, however, as we got further in what we saw captured our hearts and still does to this day- The Great Smoky Mountains! At first thought it may seem like the mountains are nothing more than an area for great hiking, however you will soon discover that the mountains hold so much more! Within the nearby towns, there is a lot of entertainment and fun for everyone! After driving awhile, we came to a town called Sevierville. It was there that we saw something off the main road that captured our attention with a massive lit-up funnel like structure coming off the side of it’s building: Wilderness at the Smokies. 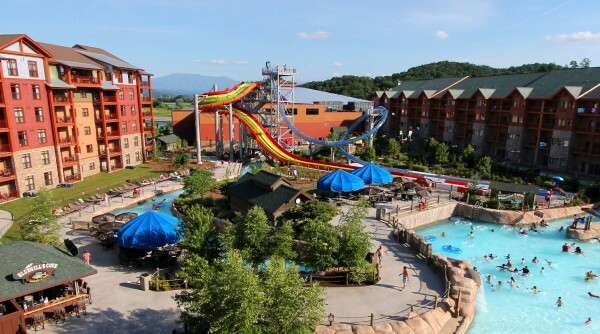 It is known as Tennessee’s largest family resort and includes one sizable indoor and two outdoor waterparks. It is a great place for families to stay and relax while also having a lot of fun. The outdoor waterparks– Lake Wilderness Outdoor Waterpark and Salamander Springs Outdoor Waterpark– are only open during the summer. 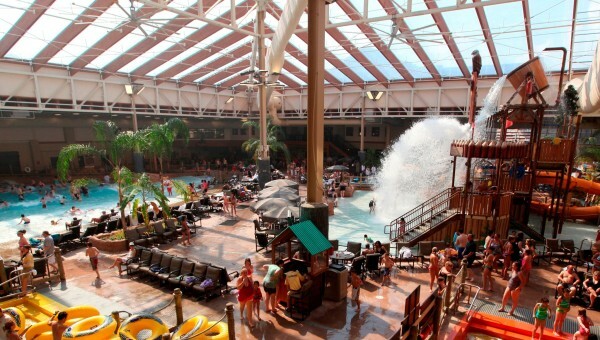 The indoor water park (Wild WaterDome Indoor Waterpark), however, is open year-round! The water parks include several water slides, tube slides, water racers, surf riders, lagoons, rivers, and even spas for us mommies. Our family really loved the Storm Chaser Thrill Ride- which we eventually figured out was the massive funnel like structure that caught our attention to begin with- which is a waterslide that gives its riders a hair-raising experience! Four guests plummet 55 feet down a thrilling, dark tunnel ride before dropping through a zero gravity fall into a funnel where they experience several fast oscillations before splashing into a pool below. Be prepared for the ride of your life! Note: A few of the water rides include a minimum height requirement of 48’’. After spending 5 hours at the waterparks, my husband and I decided (along with much begging from the kids) that we had to stay overnight at the resort… and we were in luck, a room was actually available! Normally I would suggest booking ahead as they tend to stay booked up. There are a few different lodging options to choose from at Wilderness. Since we are a family of five, we opted to stay at the River Lodge. We wanted to be sure we chose a room that had enough space for all of us as well as comfort and boy did it deliver! 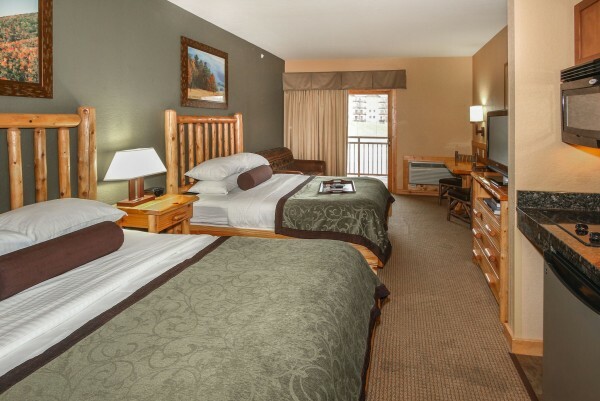 River Lodge offers a variety of suite styles that are designed to accommodate families while allowing for the convenience of extra room to spread out. Our largest suite sleeps up to 15 people, which includes multiple sleeping rooms, a full kitchen and family room with fireplace. River Lodge is also connected to the Wild WaterDome Indoor Waterpark and also has many other features including: Lake Wilderness Outdoor Waterpark, Cataloochee Creek Adventure Golf, The Thirsty Miner Restaurant, Mountain Marketplace, Outpost Gift Shop, Back Country Arcade, Paint Your Own Pottery, a Fitness Center and Guest Laundry. Another option, Stone Hill Lodge features upscale furnishings, with a mountain-modern decor. Rooms have flat screen TV’s, refrigerators, microwaves, coffee makers, irons and ironing boards and in-room safes. Stone Hill Lodge also features: Salamander Springs Outdoor Waterpark, Hidden Trail Bar and Grill, Black Bear Boutique, Back Country Arcade, a Fitness Center, a Business Center and Guest Laundry. From double queen hotel rooms to king executive suites, they are sure to have the room that is perfect for your family. Lastly there is Sanctuary Villas, which are luxurious, golf front villas, less than a mile from all the other Wilderness amenities. All Villas are fully furnished with every amenity your family might desire along with a private terrace and game room. Enjoy golf course seclusion and also waterpark access! After we checked out of our room and went to the waterparks for one last time, my kids started to get really cranky- partly because they didn’t want to leave but also partly because they were exhausted and were in the need of some good food. When traveling, Trip Advisor is my best friend. My husband and I searched for local places with great reviews and found the Hatflields & McCoys Dinner Show all I had to do was read the online description and instantly it cheered the kids up! If you’re searching for a place to eat and have a laugh, look no further! 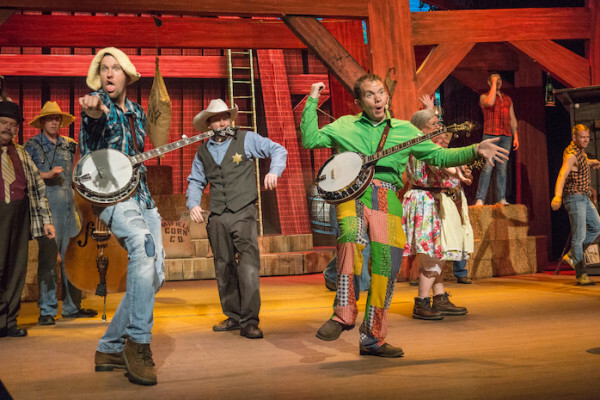 At the Hatfield & McCoy’s Dinner Show you can enjoy a nice homemade, country style dinner while watching one of the best comedy shows in Pigeon Forge. Dinner includes an all-you-can-eat line-up featuring some of the best food in Pigeon Ford, according to Trip Advisor- and we’d have to agree. 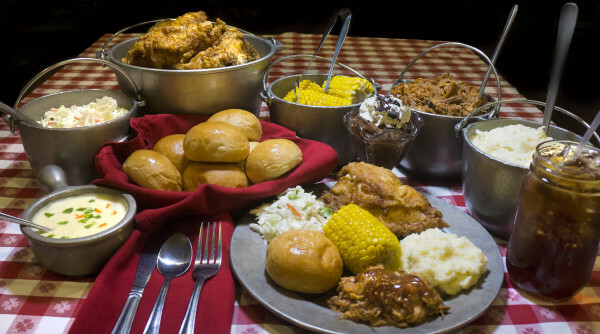 The menu included country fried chicken, open pit pork barbeque, a southern style creamy vegetable soup (my absolute favorite – I was even able to buy the soup mix in the gift shop after the show to take home to make), corn on the cob, mashed taters, coleslaw, homemade rolls, and a specialty dessert. Everything was amazing and the chicken was so tender and juicy—we definitely had to ask for seconds and our waiter was all to happy to oblige. We received excellent service and with a smile! The on-stage staff delivered an outstanding show called “A Family Feud.” We were laughing so hard watching folks dressed in country-style attire—men with straw hats and overalls pick guitars and sing and women with plaid dresses and boots dance and sing and give a great story line filled with humor. There was never a dull moment watching the two families banter back and forth. Just be sure you chew and swallow your food quickly… or the person sitting across from you may not be very happy when coleslaw comes flying across the table because you let out a big belly laugh! 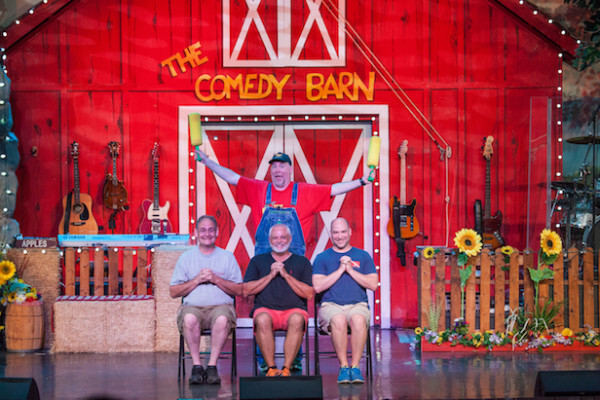 If after Hatfield & McCoy’s your begging for more comedy on your trip be sure to check out The Comedy Barn also located in Pigeon Forge. The Comedy Barn is actually a sister venue to the Hatfield & McCoy’s and combo tickets are available at a discount when you book both. Just like The Hatfield and McCoy’s Dinner Show the Comedy Barn offered up a ton of laughs and a great meal. Dinner for this show however is served at The Frizzle Chicken Farmhouse Cafe right next door. There your family will receive an amazing feast that includes Savory Pot Roast, Fried Chicken Breast, Mashed Potatoes, Macaroni and Cheese, Green Beans, Homemade Pasta Salad, Cream of Chicken Soup, Rolls, and for dessert Banana Pudding or Chocolate Cake. The Comedy Barn show times are 5pm and 8:15pm nightly. Tickets are $29.95 per adult and $9.95 per child. You can ADD ON the dinner option for $19.95 per adult and $9.95 per child. 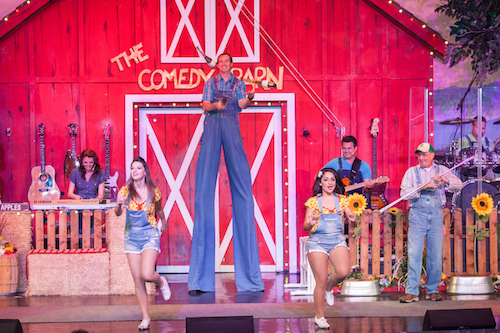 The Comedy Barn has a variety of acts: magicians, jugglers, ventriloquists, comedians, amazing trained animals, tap dancing, live country and gospel music! They also bring unsuspecting audience members into different parts of the show and trust me when I say that will leave your stomach sore from laughing so hard! The Comedy Barn show offers seasonal acts as well and has a special Christmas Show for the holidays. Your family is sure to have endless streams of laughter and fun! Back in the van and a few minutes away from Pigeon Forge, we arrived in a quaint little mountain town called Gatlinburg. As we drove in we saw a billboard advertising an awesome-sounding attraction called Ripley’s Aquarium of the Smokies. 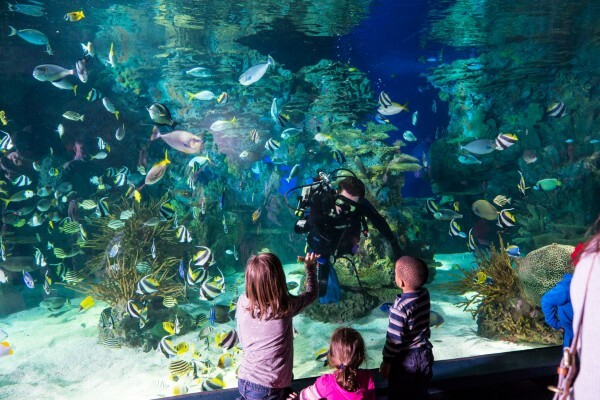 I quickly Googled it and found out that it was voted “The Best U.S. Aquarium” by USA Today in 2017 and it’s no wonder why, it has something to offer the whole family! 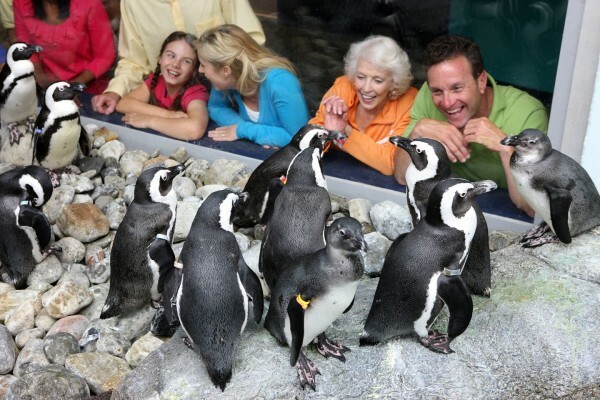 From penguin encounters, to swimming with stingrays and painting with penguins… no matter what activity you choose at the Aquarium, you and the family will never get bored! Ages 4 and up can make a new furry little friend— a penguin! Staff members are on-site to monitor the encounters. The penguins are well trained to interact with visitors. They can pet the penguins and even get a photo with them. Children ages 4-7 must be chaperoned by an adult and the staff. Prices are $44.99 for one adult to chaperone one child. Ever wanted to get up close and interact with a stingray? If so and if you are at least 40” tall and 5 years old, you can splash (swim) with the stingrays for only $29.99! My family was able to swim with the stingrays together and it is something we will never forget! Just be sure not to forget your swimsuit / trunks as they are required attire for this activity. Towels however are provided. Feeling artsy? And love penguins too? Try a penguin painting class with these little furry friends! For only $79.99 per person, you can help a penguin create a cool work of art. You will choose a color or two, dip your penguin’s feet in the colors, and watch your penguin get to work as he or she walks colored footprints all over a piece of 8×10 white canvas paper! My youngest son absolutely loved this activity because he loves painting and penguins are his favorite animals! Again a chaperone is required here for children ages 4-7 and it’s an additional $19.99 to chaperone one child in addition to the general penguin painting class admission. Some other cool opportunities at the aquarium include live shows; gift shops; cafés; viewing coral reefs and coral fish; the Discovery Center (where you can get hands-on with aquatic creatures of many types); Gallery of the Seas (you can view octopuses, jellyfish, lionfish, spider crabs, cuttlefish, and other mesmerizing ocean creatures); Stingray Bay; Penguin Playhouse; Ocean Realm; Shark Lagoon; Touch A Ray Bay; and Tropical Rainforest (creatures of the rainforest). The aquarium also offers birthday parties and group activities such as Sleeping with the Sharks (spend a night under a dome watching the sharks), classroom field trips and events (includes discounts for teachers and students and advanced group booking online). General admission is $34.99 per Adult, Children ages 6-11 are $19.99 each and Children ages 2-5 are only $9.99 each. If you would like an Aquarium guide, it is an additional $2.99. Ripley’s also offers combo tickets to Aquarium as well as some of its other attractions. 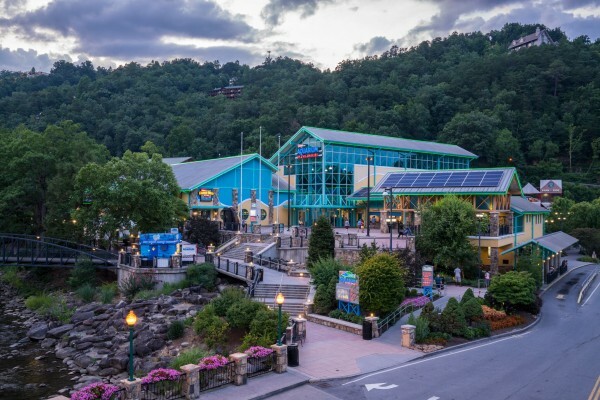 Beyond waterparks, comedy shows, great food and the aquarium, another amazing way to experience the area is to explore the Great Smoky Mountains itself! The Great Smoky Mountains National Park is a must! The park covers a large area from Tennessee to the North Carolina border. It is known as America’s most visited National park for a reason—there’s so much wildlife diversity, so many beautiful views, great hiking trails and interesting things to do there. While hiking we came across a couple black bears in the distance (always hike with caution), a beautiful assortment of wildflowers, a variety of birds, and fireflies once it got dark along with many other mysterious and interesting creatures that reside within the mountains. 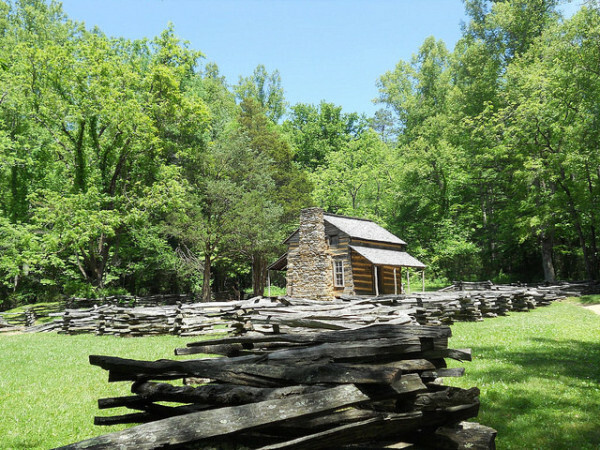 One of the most popular areas of the National Park is Cades Cove. 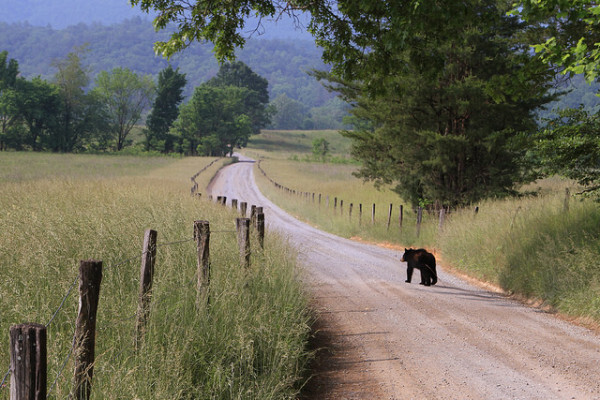 Cades Cove is an isolated valley located in the Tennessee section of the Great Smoky Mountains National Park. The valley was home to numerous settlers before the formation of the national park. It is a very popular place to capture breathtaking views of the mountains. Here, it was possible for my family to see a lot of white-spotted deer, black bears, raccoons, turkeys and other animals. There was even the opportunity to set-up camp close by (with tents and RV’s) if you wish to be further immersed in the wildlife! Around the area we saw a lot of historical houses that dated back to the 19th century. My husband (who is a History Channel buff) loved this! Some of the things we came across were churches, windmills, log homes, barns and old school houses. No matter what you come across, there is sure to be some kind of historic story or fact behind it providing a great opportunity for a history lesson for the kiddos! 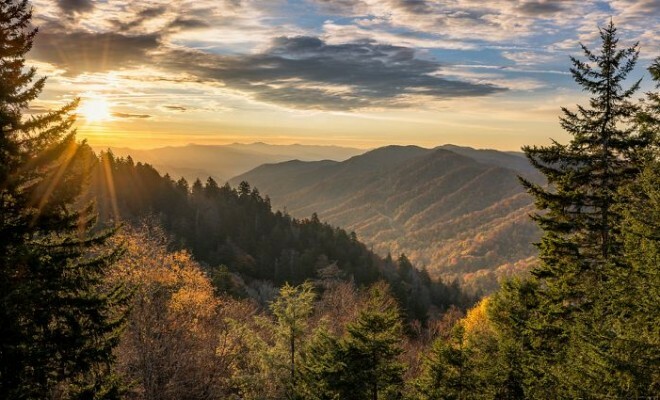 Open year-round, the Smoky Mountains of course offers a lot of opportunity for great hiking and even kid-friendly hikes. Some of the more popular destination hikes include Charlies Bunion, Alum Cave Bluffs, Andrews Bald, Rainbow Falls (a hike to a beautiful 80 foot waterfall that shapes into an hourglass in the winter), and Chimney Tops (a much steeper climb/hike). Our family’s favorite was Rainbow Falls- the waterfall was amazingly beautiful! Yes, this Tennessee, Great Smoky Mountains “Adventure” left my family feeling more than satisfied with our spontaneous and un-routine vacation. Whether your interest is hiking, swimming, laughing until you hurt or getting up close and personal with natures furry and feathery residents, you are bound to have an awesome time and make unforgettable family memories with a Great Smoky Mountains’ Vacay! What are you waiting for!? !